This is a guest post from John Smith. He blogs about long term investment options. He talked about identifying moats of the economy to invest for long term, in his previous guest post. Enjoy another thought-provoking post! Earlier, we discussed moats, and how to identify them. Throughout the article, I used Visa (NYSE:V) and MasterCard (NYSE:MA) as examples of moats. In this article, we will discuss why they are fit for a long-term investor, and find Visa and MasterCard’s moats (along with the moats of railroads). Before examining the moats of the two companies, we must first understand their business. According to the Yahoo Finance business summary of Visa, “The company facilitates commerce through the transfer of value and information among financial institutions, merchants, consumers, businesses, and government entities.” (MasterCard’s description is practically the same). Warren Buffett is notorious for his lack of interest in technology companies. His philosophy against tech companies (which I agree with), is that the world of technology is ever-changing. For a technology company (Company A) to maintain its profits, they must have the greatest or cheapest technology, meaning they have to spend billions on R&D every year. As soon as another company (Company B) creates a better or cheaper technology, than Company A, Company A’s profit will massively decline. Visa and MasterCard are often referred to as technology companies. Even though they make their profits through transfers of money and data (which go through their technology), their immense network makes them not as tech-y as products that profit solely off being cheap or the best. If another company were to create a network with better technology than Visa and MasterCard’s, the two largest players would not be affected, because of the convenience that the network provides for merchants and consumers alike. The same can be said about IBM. Even though they profit off technology, they have become more of an IT services company. Warren Buffett invested in Visa and MasterCard, along with IBM, which is in his “Big Four” (the other three being Wells Fargo, Coca-Cola, and American Express). Visa and MasterCard have about $6 billion and $3.5 billion in free cash flow, respectively. The companies’ limited exposure to new technology makes the companies safe bets in a world where cash is becoming less popular, and e-commerce is thriving. They are practically the railroads of money. In the railroad industry, there is very little competition, and there are only about 8 major railroads, all of which have their own “regions”. Even though the regions overlap, they often don’t overlap in individual ports. This is exactly like Visa and MasterCard. They are the railroad of money for almost the entire U.S., and it’s only them two competing (along with Discover Financial, but they are a smaller player). To read more about railroads, and why they are also fit for the long-term, check out my article here. The main threats to Visa and MasterCard are PayPal and American Express (with secondary threats coming from Discover Financial). PayPal’s threat mostly exists in e-commerce. Most internet shops have a simple PayPal option, where you sign into PayPal and pay up quickly, rather than entering your credit card. However, PayPal is not as present in brick-and-mortar transactions, making Visa and MasterCard still prime players, as seen by their market share in brick-and-mortar transactions. As you can see by the chart, American Express has about 11% of the market. However, this does not pose a threat to Visa and MasterCard. American Express makes the credit cards, and has merchants accept those credit cards. Through this process, American Express can have high profit margins, as they have complete control of the entire cycle. They are the issuing, receiving, and processing bank, giving them maximum profit. However, this means they only get the profit off people using their cards, which becomes problematic as fewer merchants or customers may use the card (for example, Costco, whose cards give about $2.2 billion in annual revenue to American Express, recently replaced American Express as their card provider). As discussed in the previous guest post, a moat protects the company’s earnings from competitors. The large and growing networks make using Visa and MasterCard’s networks, a must for consumers and merchants alike. For merchants, being unable to use Visa and MasterCard creates and inconvenience for buyers, most of whom have Visa and MasterCard, often deterring them from the product or service. On the consumer end, not using Visa and MasterCard makes you unable to buy from the merchants. This effect magnifies the success, just as a powerful brand name does; as more people use the product, it becomes more noticeable, and more convenient to use what most people are using. Visa and MasterCard are great bets for the long-term. They control a large chunk of the payment processing industry. With cash becoming less popular, and e-commerce growing, Visa and MasterCard seem well-positioned for future earnings growth. This earnings growth will be retained, as new technology is not a threat to them, due to their large moat (the network), and their large amounts of free cash flow. Even though their valuations are a little rich at the moment, “it’s far better to buy a wonderful company at a fair price than a fair company at a wonderful price.” (Warren Buffett). Author Bio: John Smith is a long-term investor, who enjoys researching stocks and doing all things investing in his free time. He tries to invest like Warren Buffett and writes about anything in the world of investing on his blog, Big Analysis on Big Stocks. SB’s thoughts – I am not so sure about American Express not being a big threat to MasterCard and Visa. I believe they are. We often see merchants not willing to accept an AMEX, as a result MasterCard and Visa are kind of being mandated across many stores. This practiced is getting actively challenged by AMEX in the court of law. And as John said, AMEX gets to pocket the entire processing fee, the moment AMEX becomes as acceptable as a Visa and MasterCard, they may replace the big two, in no time. 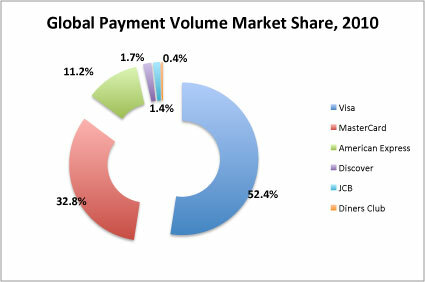 I agree that Visa and MasterCard together holds a lion’s share of the payment processing industry. 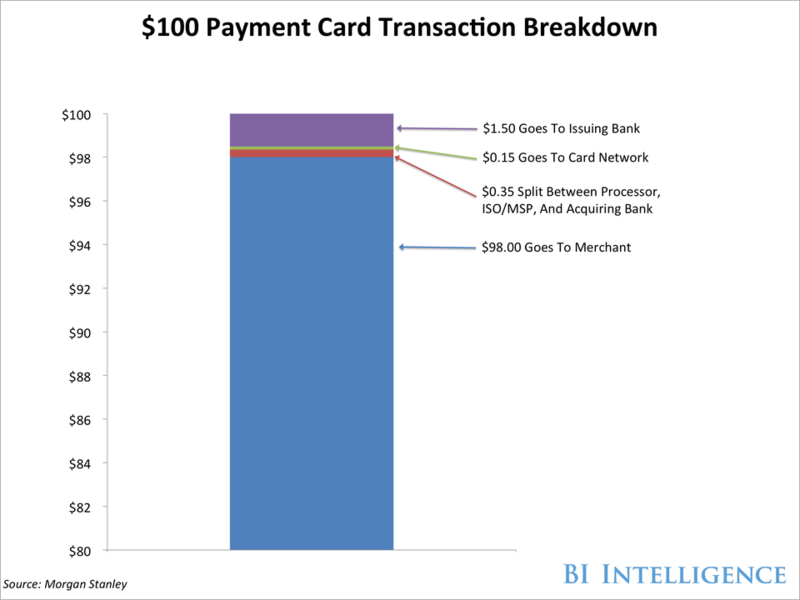 But equation may change in the world of Apple Pay, Google wallet and Samsung pay. But, John’s central idea of investing in financial moats is a good long-term strategy. When I think of moats in other blocks of the economy. I find Intel, Wal-Mart, Coca-Cola really standing out from the rest. Disclaimer – I hold Visa(V) and AMEX (AMX) stocks. Great post. I can tell that you’ve put a lot of time into choosing your investment strategy! I do want to state add a two sense clarification on the stock market. Although we’d like to think that the stock market is logical (you make better/cheaper products therefore you have higher stocks), the truth is the stock market goes up when more people buy than sell and it goes down when the two are reversed. That is the only logic in the stock market. For example: Apple arguably has had better computers than Microsoft since the late 1990’s, but apple stock has only just surpassed Microsoft’s as of 2007. On an hourly scale, stocks can drop and rise dramatically based on rumors, news articles and gossip, not products and services. I’m not saying that any of the stocks you listed are bad, I’m just saying that when you invest in single stocks you are much more subject to this turbulence. Investing in industries (via ETFs and mutual funds), however, lets you ride all technology to the top. Author here. Yes, I do agree very much that while investing in single stocks, you are very vulnerable to unsystematic risk (risks caused by earnings reports and rumors about company, compared to systematic risk, which is risk that can’t be taken away because almost all large-caps will still fall in we have a recession and bear market). However, if there are many, well researched, large companies is diversified to which case unsystematic risk is at a minimum. Also, about the technology, that’s the main reason WB doesn’t like technology; it’s quite difficult to pick which tech company will still sell the most phones or computers or chips or whatnot. This happens much, much less with other industries though; if P&G has been around since 1837 selling practically the same products (or the same type of products… soap, bath products, laundry, etc. ), then they will likely keep doing that in the near future. Furthermore, there is very little change in the soap and laundry industry. The same can be said about companies like J&J.